There was dissatisfaction with the dictionaries of the period, so in June 1746 a group of London booksellers contracted Johnson to write a dictionary for the sum of 1,500 guineas (£1,575), equivalent to about £230,000 as of 2013. Johnson took nearly nine years to complete the work, although he had claimed he could finish it in three. Remarkably, he did so single-handedly, with only clerical assistance to copy out the illustrative quotations that he had marked in books. Johnson produced several revised editions during his life. 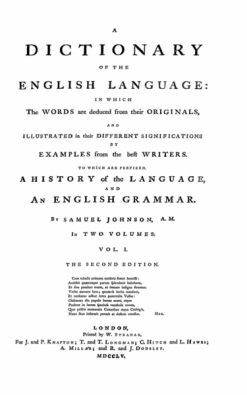 Until the completion of the Oxford English Dictionary, 173 years later, Johnson's was viewed as the pre-eminent English dictionary. According to Walter Jackson Bate, the Dictionary "easily ranks as one of the greatest single achievements of scholarship, and probably the greatest ever performed by one individual who labored under anything like the disadvantages in a comparable length of time". A hundred years earlier, books had been regarded with something approaching veneration, but by the mid-eighteenth century this was no longer the case. The rise of literacy among the general public, combined with the technical advances in the mechanics of printing and bookbinding, meant that for the first time, books, texts, maps, pamphlets and newspapers were widely available to the general public at a reasonable cost. Such an explosion of the printed word demanded a set pattern of grammar, definition, and spelling for those words. This could be achieved by means of an authoritative dictionary of the English language. In 1746, a consortium of London's most successful printers, including Robert Dodsley and Thomas Longman – none could afford to undertake it alone – set out to satisfy and capitalise on this need by the ever increasing reading and writing public. In 1598 an Italian–English dictionary by John Florio was published. It was the first English dictionary to use quotations ("illustrations") to give meaning to the word; surprisingly, in none of these dictionaries so far were there any actual definitions of words. This was to change, to a small extent, in schoolmaster Robert Cawdrey's "Table Alphabeticall", published in 1604. Though it contained only 2,449 words, and no word beginning with the letters W, X, or Y, this was the first monolingual English dictionary. The problem with these dictionaries was that they tended to be little more than poorly organized and poorly researched glossaries of "hard words": words that were technical, foreign, obscure or antiquated. But perhaps the greatest single fault of these early lexicographers was, as one historian put it, that they "failed to give sufficient sense of [the English] language as it appeared in use." 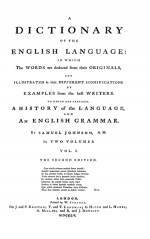 In that sense Dr. Johnson's dictionary was the first to comprehensively document the English lexicon. A Dictionary of the English Language was somewhat large and very expensive. Its pages were 18 inches (46 cm) tall and nearly 20 inches (50 cm) wide. The paper was of the finest quality available, the cost of which ran to nearly £1,600; more than Johnson had been paid to write the book. Johnson himself pronounced the book "Vasta mole superbus" ("Proud in its great bulk"). No bookseller could possibly hope to print this book without help; outside a few special editions of the Bible no book of this heft and size had even been set to type. Despite the Dictionary's critical acclaim, Johnson's general financial situation continued in its dismal fashion for some years after 1755: "The image of Johnson racing to write Rasselas to pay for his mother's funeral, romantic hyperbole though it is, conveys the precariousness of his existence, almost four years after his work on the Dictionary was done. His financial uncertainties continued. He gave up the house in Gough Square in March 1759, probably for lack of funds. Yet, just as Johnson was plunging into another trough of despondency, the reputation of the Dictionary at last brought reward. In July 1762 Johnson was granted a state pension of £300 a year by the twenty-four-year-old monarch, George III. The pesion did not make him rich, but it ensured he would no longer have to grub around for the odd guinea." Despite the criticisms, "The influence of the Dictionary was sweeping. Johnson established both a methodology for how dictionaries should be put together and a paradigm for how entries should be presented. Anyone who sought to create a dictionary, post-Johnson, did so in his shadow." "In his sparkling history of the Oxford English Dictionary, Simon Winchester asserts of its eighteenth-century predecessor that 'by the end of the century every educated household had, or had access to, the great book. So firmly established did it swiftly become that any request for "The Dictionary" would bring forth Johnson and none other.' 'One asked for The Dictionary,' writes Winchester, 'much as one might demand The Bible.'" One of the first editors of the OED, James Murray, acknowledged that many of Johnson's explanations were adopted without change, for 'When his definitions are correct, and his arrangement judicious, it seems to be expedient to follow him.' ... In the end the OED reproduced around 1,700 of Johnson's definitions, marking them simply 'J.'." Johnson influence was not confined to Britain and English: "The president of the Florentine Accademia declared that the Dictionary would be 'a perpetual Monument of Fame to the Author, an Honour to his own Country in particular, and a general Benefit to the Republic of Letters'. This was no empty commendation. 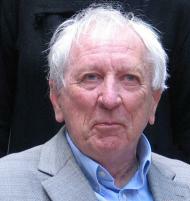 Johnson's work served as a model for lexicographers abroad. It is no surprise that his friend Giuseppe Baretti chose to make the Dictionary the model for his Italian—English dictionary of 1760, and for his Spanish dictionary nearly two decades later. But there are numerous examples of influence beyond Johnson's own circle. His work was translated into French and German." And "In 1777, when Ferdinando Bottarelli published a pocket dictionary of Italian, French and English (the three languages side by side), his authorities for the French and Italian words were the works of the French and Italian academies: for the English he used Johnson." Johnson's Dictionary has been available in replica editions for some years. The Preface to the Dictionary is available on Project Gutenberg. In addition, a scan of the 6th (1785) edition can be found at the Internet Archive in its two volumes.